Safe Rooms, Storm Shelters,Gun Vaults, Modular Vault, Evidence Rooms. When severe weather threatens, individuals and families need advance warning and protection from the dangerous forces of extreme winds and life threatening events. Individuals and communities in high-risk tornado and hurricane areas need structurally sound shelters and early alert systems. In general, residential safe rooms may be built on site, in a new or existing home, or may be manufactured units delivered to the site and installed. A safe room may be built or installed anywhere in a house with a sound concrete foundation for anchoring. For maximum strenght against high winds, it must be a "room within a room" (a self supporting structure). It's walls, ceiling, and floor must be structurally separate from the rest of the house or building so that even if the surrounding structure is destroyed, the safe room will be left intact. If design, construction and anchoring is done correctly, the results after a direct hit from a larger tornado should look like the photos below. It's obvious from the pictures below, one can clearly see that both of these strutures have done there duty, and performed structuraly exactly what they were designed for. (Photo right) In this May 26,, 2011, photo, a safe room is one of the few things remaining in Piedmont, Okla., after a deadly tornado moved through the Falcon Lake neighborhood.AP Photo/Sue Ogrocki. In the event of severe weather, the occupants of a house equipped with an internal safe room is able reach the shelter without having to leave the house and risk exposure to high winds, flying debris, lightning, or other storm conditions. For those reasons, the occupants of a house equipped with an internal safe room are more likely to protect themselves adequately. Below are examples of what are called 'pre-construction' or 'drop in safe rooms. These units may be integrated into the floorplans of new construction. All electrical and A/C and heating ducting are figured into the design. This type of structure will look like a normal closet when finished out. Whether it be a simple safe room equipped with a FEMA 320 rated door, or firerated with a vault door, it' just a matter of adopting the design to fit the individuals needs. Our stand alone safe rooms for new construction may be manufactured to the size of the closet or room of new, or exsting home. If your in the process of building a home we can design our safe rooms around your floorplan design. It is always more cost effective to build a drop-in safe room other than a modulare one. The build time is generally 40% faster for a drop-in as compared to a modular system. This is due to the labor invoved in designing and constructing the connections. For better quality control of the products we design and manufacture, RhinoVault fabricates its own safe room doors, safe rooms and vault products in our own facility. From there we can either ship the units crated or palleted, or as in many cases as a kit. We also have installation crews that may travel to install in many areas of the United States. Larger bolt together systems may be designed and built for a larger building or designated area of your home or business. The height of our vaults usually have a minimum 6" drop down. Be alert to changing weather conditions. EXTREME PROTECTIVE SAFE ROOMS (PANIC ROOMS). 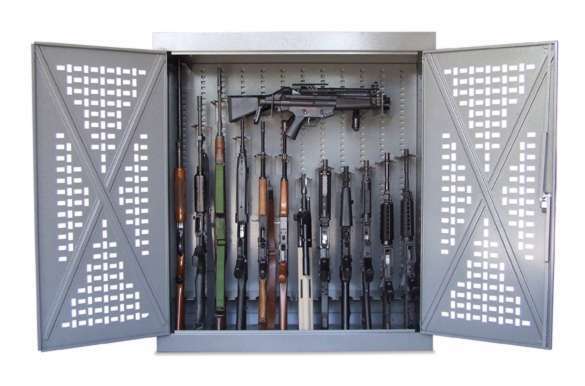 For extreme protection against firearms ous safe rooms may be built out of ballistic rated panels or armor hardplate for resistance against both low and high caliber projectiles. 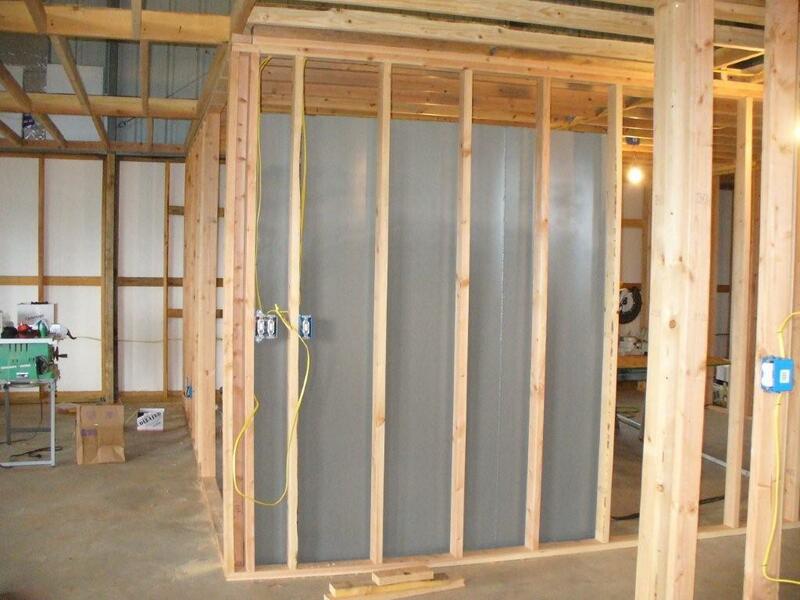 This type of safe room is used primarily against forced entry and may use existing wall studs to attach security panels to. The difference between this type of safe room and the ones described above is that this type of safe room is not designed for wind. Although a safe room can be designed for both wind and entry protection, the design for just entry and firearms may be different. 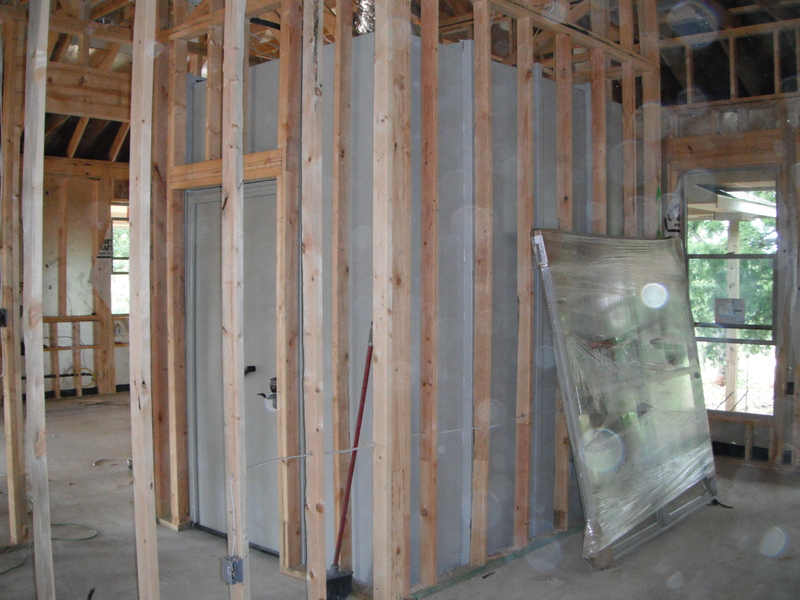 The picture above left, shows a safe room that was built and set onto the concrete slab prior to the framing of the house. This safe room was complete with lighting, electrical outlets, and an offset ventilation duct was added for A/C and heat. Remember to use a good door for the opening of your safe rooms. Check the thickness of the skins and total weight of the doors before you order. The heavier the better. Don't make the opening of your safe room the weak link. Safety first. Moving an 8,000 lb. safe room / walk-in vault is achieved by a few people and machinery skates located on three points under the shelter. The cord on the door is an extension cord that is plugged into a wall oulet for the lighting until it is hard wired in to the building. Lighting and electrical are included in most of our safe rooms and vaults. Once the anchoring of the structure is finished, these safe rooms and vaults are ready for use. Many of our doors are custom built for security and funtionality. Wood overlay and taller 8ft doors may be constucted to match the existing design of the home. 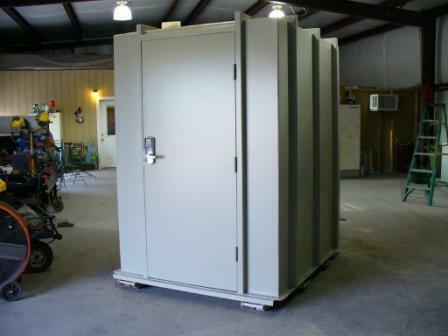 Man of our safe rooms and vaults are built to the specific size and security needs of the customer. Whether it's a standard wind rated safe room or a vault for guns or valuables we can design and construct a room that will fit your needs. Ribbing on the side of the one pictured directly above is for greater lateral and horizontal loads that may be applied during extreme wind events. The tubing is welded to the plate steel, thus strengthening the room for maximum protection. Kind of like a additional protective cage. Not all safe room companies do this, but we think it helps the overall design. If smooth outside walls are desired, where the exterior of the vault wll be seen, garage, warehouse, etc., the tubing may be placed on the inside. Sheetrock may also be attached to the inside or outside of the shelter using these structural 'ribs' to attach to. They are usually space 24" @ center horizontally where possible. "Extreme windstorms in many parts of the country pose a serious threat to buildings and their occupants. Your residence may be built �to code,� but that does not mean it can withstand winds from extreme events such as tornadoes and major hurricanes." If you know the weather conditions are ripe for severe weather, make it a household rule to tune in to your local radio or tv station. Severe weather can turn deadly in minutes. Track the direction of the storm and make a plan for your family. Remember to keep batteries up in your flashlight and if you can purchase a NOAA radio. Check Radio Shack or Walmart . It's a great investment. Natural gas leaks and explosions are responsible for a significant number of fires following disasters. It is vital that all household members know how to shut off natural gas. Because there are different gas shut-off procedures for different gas meter configurations, it is important to contact your local gas company for guidance on preparation and response regarding gas appliances and gas service to your home. Be sure not to actually turn off the gas when practicing the proper gas shut-off procedure. If you smell gas or hear a blowing or hissing noise, open a window and get everyone out quickly. Turn off the gas, using the outside main valve if you can, and call the gas company from a neighbor�s home. Extreme windstorms in many parts of the country pose a serious threat to buildings and their occupants. Your residence may be built �to code,� but that does not mean it can withstand winds from extreme events such as tornadoes and major hurricanes. The purpose of a safe room or a wind shelter is to provide a space where you and your family can seek refuge that provides a high level of protection. You can build a safe room in one of several places in your home. -A top a concrete slab-on-grade foundation or garage floor. -An interior room on the first floor. Individuals and communities in high-risk tornado and hurricane areas need structurally sound shelters and early alert systems. A small interior room above grade is the best location for a safe room. Safe rooms are often used for other non-emergency purposes. Bathrooms and large closets are a frequent choice. Because warning times for tornadoes can be very short, quick access to the safe room is important in choosing location. If the owners have any special accessibility needs these should be considered in the location and design of the safe room. Safe rooms built below ground level provide the greatest protection, but a safe room built in a first-floor interior room also can provide the necessary protection. Below-ground safe rooms must be designed to avoid accumulating water during the heavy rains that often accompany severe windstorms. To protect its occupants, a safe room must be built to withstand high winds and flying debris, even if the rest of the residence is severely damaged or destroyed. The safe room must be adequately anchored to resist overturning and uplift. The walls, ceiling, and door of the shelter must withstand wind pressure and resist penetration by windborne objects and falling debris. The connections between all parts of the safe room must be strong enough to resist the wind. Sections of either interior or exterior residence walls that are used as walls of the safe room, must be separated from the structure of the residence so that damage to the residence will not cause damage to the safe room. As weather patterns change, an increasing number of homeowners are building safe rooms to protect their families from the extreme wind events, and personal safety. Having a secure room in a home can provide a family a place to go when severe weather hits, and also provide a place to secure valuables and keep any number and type of firearms out of site from curious eyes. RhinoVault specializes in custom sizes and can build a safe room or security vault to fit into an existing space, in a existing home or business. 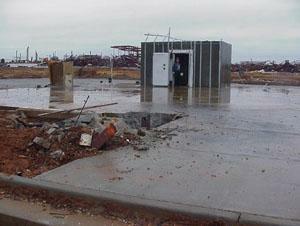 Safe rooms and Vaults must be anchored to a sound concrete slab to provide FEMA rated high wind protection. This is achieved by using high strength wedge type anchors along the bottom anchoring flange along to bottom of each safe room and vault. 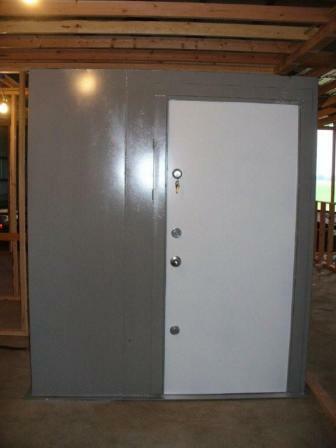 Our safe rooms are generally equipped with 3 heavy duty ball bearing hinges with commercial grade deadbolts (2 or 3 that are keyed alike) or internal sliders and one commercial locking entry handle. For our safe rooms and vaults, electrical outlets, lighting, secure venting, communication line conduits, and other types of options may be added at customers request. Venting may also be put into the door for more air flow if needed. Our drop-in safe rooms are generally installed using 6 ton machinery skates (3) giving the installation process a low foot print. No skidding is evident after the Installation which only takes only a few hrs on a new slab if access is permitting. A crane or boom truck is only used where location and / or access is an issue. This keeps the cost of installation to a minimum. If valuables or guns need secure storage, a customized vault door may be added to the inside of the room like the one below along with furring strips to attach UL fire rated sheetrock to. We also may use ceramic fiber in some of the vaults more media and higher fire ratings. The nice thing about the modular units is that once purchased it may be taken with you (re-locatable), so if you ever decide to relocate, you can grab a few friends and break it down, transport it, the build it in its new location. We can do this work for you also for a fee and is rated on mileage. The ability to re-locate a vault is great for businesses that have a lease on a building. Since all the connections are done from with in the structure using 1/2" bolts, there is no need for welding, just a few handtools. The picture above shows a pre-built drop-in security vault for sensitive electronic equipment. The safe room above has an electronic keypad and three deadbolts. Some safe rooms may be constructed out of balliistic rated material. These materials will stop bullets and have a high carbon content. 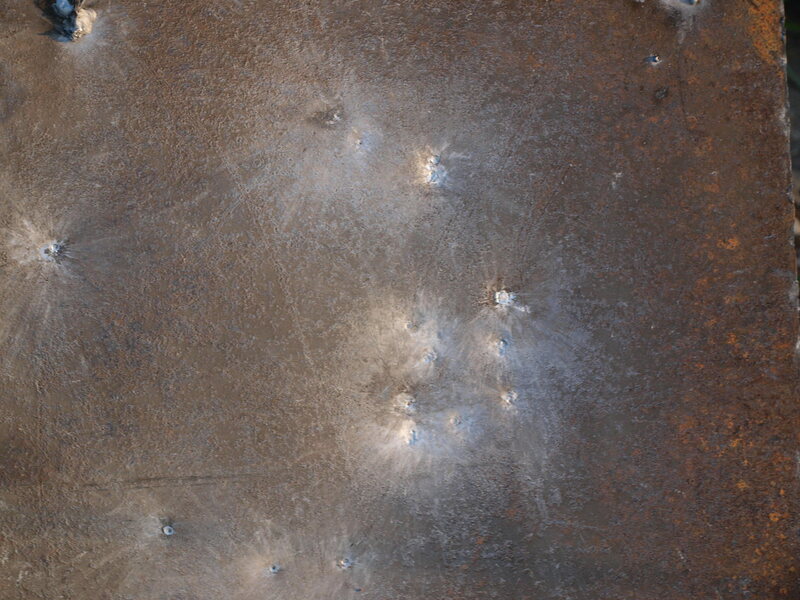 Below is an example of a 7.62 NATO round shot multiple times against ballistic armor. There are also composite panels made out of ballistic fiberglass composites that may be used for safe room construction. We can manufacture doors and safe rooms with this material. For commercial applications a non-ricochet material is used. For special applications high carbon steel may be used. Certain types of hardened steel plate has excellent anti-drill properties and is very tough against many hostile intrusion and forced entry tools. Know Your Risk And Have A Safe Place To Go� with time to get there when severe weather threatens, individuals and families need advance warning and protection from the dangerous forces of extreme winds. 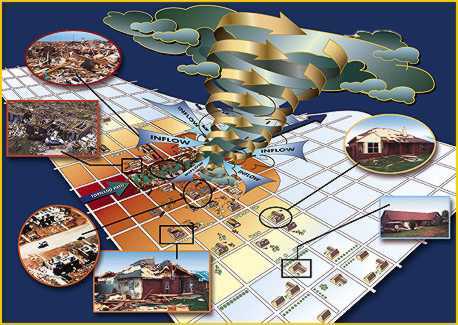 Individuals and communities in high-risk tornado and hurricane areas need structurally sound shelters and early alert systems. All orgiginal images on this page and original contents are property of rhinovault security structures and may not be duplicated, altered, or reused without written permission.